CHICAGO (Feb. 2, 2018) - U.S. Soccer, in collaboration with its member organizations, will begin conducting four new in-person Grassroots License Courses as well as the updated D License Course in the coming weeks. 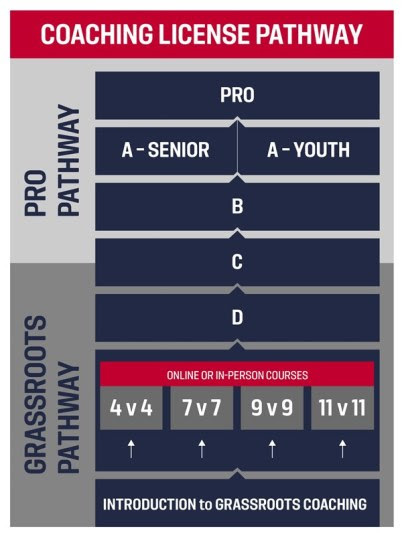 Each of these educational opportunities are hosted by U.S. Soccer member organizations and are tailored around the four new Grassroots game models: 4v4, 7v7, 9v9, and 11v11. These course options will offer coaches the chance to learn more about how to develop a player-centered approach to coaching. Spanning 4-hours in length, each in-person Grassroots Course consists of both classroom and field-based sessions. Coaches will learn more about U.S. Soccer's Coaching Education philosophy, Play-Practice-Play Methodology, and the Six Tasks of a Grassroots Coach among other topics. The newly revamped D License is a culmination of all four game models and an extension of the Grassroots courses. After completion of the Grassroots Courses, coaches will have the knowledge and tools to positively impact their player and the environment in which they interact. Interested coaches may begin with any in-person grassroots course of their choosing following the completion of the free Introduction to Grassroots Coaching Module, which is offered in U.S. Soccer's Digital Coaching Center. For information regarding schedule, pricing and availability of an in-person Grassroots Course, prospective coaches should contact their local member organization directly. "Grassroots is where soccer begins. These early experiences spark a child's love for the game. As a parent or coach, these courses will help build those positive experiences," said U.S. Soccer Director of Coaching Education, Nico Romeijn. "If you are completely new to coaching or the game of soccer, this is a tremendous opportunity to further your knowledge of how to teach children to learn and love the game. For the experienced coach or former player, this is an opportunity to provide a more structured approach based on the needs of the players. In both cases, the focus is on the player and how to ensure that player is able to learn, grow and have fun playing soccer." Together with U.S. Soccer, member organizations are committed to improving the experience and level of youth players through empowering coaches with low-barrier, easily accessible education.